The 3 Week Diet is an educational weight-loss program that was created by Brian Flatt. Flatt is a nutritionist and personal trainer. The 3 Week Diet is touted as being the fastest working diet plan available. The 3 Week Diet makes a lot of promises. Their website states that users will lose 12 to 23 pounds, two to three dress sizes, and two to four inches from their waistline within 21 days. It also says that users will decrease cellulite, increase muscle tone, energy and metabolism, have healthier hair and skin, and improve their cholesterol. To prove their point, the program comes with a 60-day money-back guarantee. While some may achieve the above results, the average user may become frustrated when they don’t hit those goals in such a short time period. 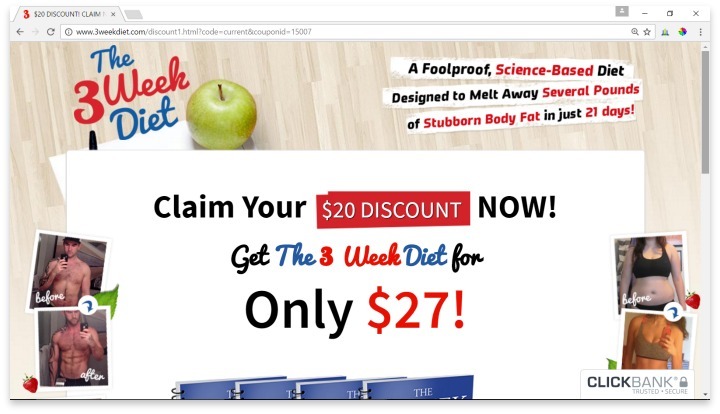 The 3 Week Diet costs $47, and users receive four eBooks. The Introduction Manual covers the theory behind this type of diet, and explains to users why it works. The Diet Manual goes over the specific foods that should be included in the user’s meal plan, and also discusses foods that should be avoided. The Workout Manual helps users get results quickly with an exercise program that includes 20-minute sessions, three to four days each week. The Mindset & Motivation Manual features tips to help overcome waning motivation. After purchase, these manuals are available for instant download. While it’s nice to have an electronic copy of these books, it would be a perk to have a printed option. Sure, consumers can print it themselves, but a copy of the book that can be referenced throughout the day is a must for some people. The best thing about this program is that the onus falls onto the user. The dieter must actually learn from the materials, rather than have their meals prepared for them. They have to learn what foods are good, and what to avoid, then transfer that knowledge to real life. These skills, once learned, are not forgotten. While that is a huge plus, some may find it to be hard. Most consumers rave about their results after utilizing the 3 Week Diet method. Many thought of it as less of a diet, and more a life-changing way of eating and exercising. This should be the main goal for any weight-loss program, and it’s refreshing to see it working for so many people. The only downside to this is that it takes real motivation to make this lifestyle change. Luckily, it seems many get that from the 3 Week Diet plan’s materials. The 3 Week Diet is an educational weight-loss program that was created by a nutritionist and personal trainer. The 3 Week Diet makes a lot of promises, and while they do set the user up to deliver on those, not everyone will have that experience. That being said, the information provided in the four eBooks that are part of the program is life changing for many. The low cost, combined with the 60-day money-back guarantee, make purchasing and utilizing the program a low-risk, low-investment opportunity. The 3 Week Diet is a good option that helps people understand nutrition, and helps them carry that knowledge into their future. Have you had an experience with this company? Please share your 3 Week Diet reviews below.